Teacher agency is an indicator of teacher development, it is also a cause for teacher development. The article aims to explore the role digital technologies can play in strengthening or constraining teacher agency in her practice, specifically in her choice and use of curricular resources in teaching. An important indicator of teacher agency is the extent to which the teacher decides the curriculum for her teaching. In the ‘text book’ culture, predominant in Indian education, the teacher is expected to transact the text book and ensure that its contents are able to be reproduced by the students, without referring to it, in the examination, with or without understanding. Teachers are not expected to explore multiple sources of learning materials and configure learning experiences for students. In the era of digital technologies, this problem is threatening to become worse. Earlier the teacher was expected to transmit the content to students. Now Pre-packaged content is being made available to students directly through digital devices like tablets, or broadcast over the internet. This can further reduce the role and possibilities for the teacher in the teaching-learning processes. On the other hand, digital technologies can be used to further the agency of the teacher in this respect. Building teachers capacities to explore available open educational resources and use them in a relevant manner can broaden their universe of curricular possibilities. Secondly, becoming member of digital networks can enable teachers to share resources accessed, created or adapted by them, increasing the overall pool of contextual resources. 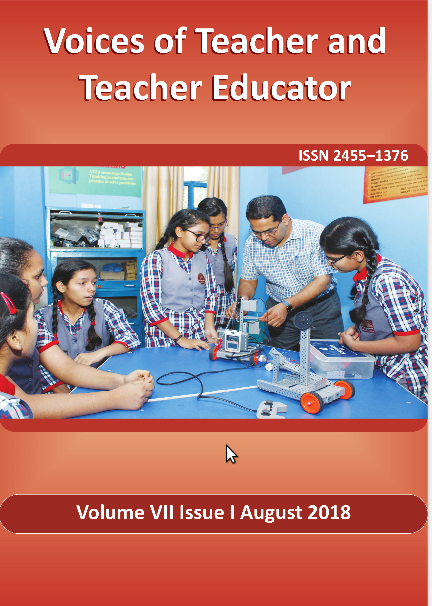 The Subject Teacher Forum program of Karnataka attempted these approaches of integrating digital technologies and provided more opportunities for teachers to access and use varied resources in their teaching. Whether the design of digital technology programs in education furthers or constrain teacher agency can thus be a useful parameter to assess program design and effectiveness.